Comparing the recently disclosed monthly salary of Suren Ratwatte to that of the previous CEO shows a staggering 118% increase, from Rs. 1.5 million to Rs. 3.2 million, making Ratwatte the highest-paid CEO in the history of the airline. However, an analysis of the operating financials under both CEOs show a significant deterioration in the operation of the airline under Suren Ratwatte. The average rate of growth of the Revenue had slowed down, from around 15% to around 3%. This is partly due to the knee-jerk decision to terminate high revenue generating European routes, including Frankfurt. This irrational decision may have also had a significant impact on the hospitality industry in Sri Lanka, as Germany is the largest outbound tourist market in the world, and many Germans visited Sri Lanka in the past. In the airline industry, the fuel costs are determined by the market and are generally beyond the control of any Management. This is also the main reason why airlines, including SriLankan Airlines, have been making losses in the past. Funding losses due to high fuel costs through bank loans increases finance costs, creating a circular problem. This is the main reason for the large accumulated losses under the previous CEO, Kapila Chandrasena, and not any material mismanagement, as is popularly believed. In fact, looking at the operating cost margins (excluding fuel costs) under CEO Kapila Chandrasena shows a commendable effort to hang on to cost margins at around 70% of revenue (on average), whilst operating in a period of record high oil prices. Comparatively, Suren Ratwatte had not been able to maintain these cost margins, dropping to around 80%, as shown in the charts below. Suren Ratwatte also had a rare benefit of operating at a time when world fuel prices and the fuel cost margin at the airline were at record low levels (50% vs. 25%); unfortunately, he failed to materialise the opportunity. If the CEO had not changed, and the same cost margins were maintained as done by Kapila Chandrasena in 2015, then we may have been able to see a positive operating profit in both 2016 and 2017, given the fuel cost margins were around 25% of revenue. The general critics of the airline, as well as the Presidential Commission appointed to investigate the losses at the airline, must also make an effort to understand the impact of oil prices on the profitability of the airline. They will then understand that the large accumulated losses are not due to material management failure, but due to uncontrollable world oil prices. That is the single biggest component that makes most airlines unprofitable, and its impact on our airline needs to be understood very clearly. 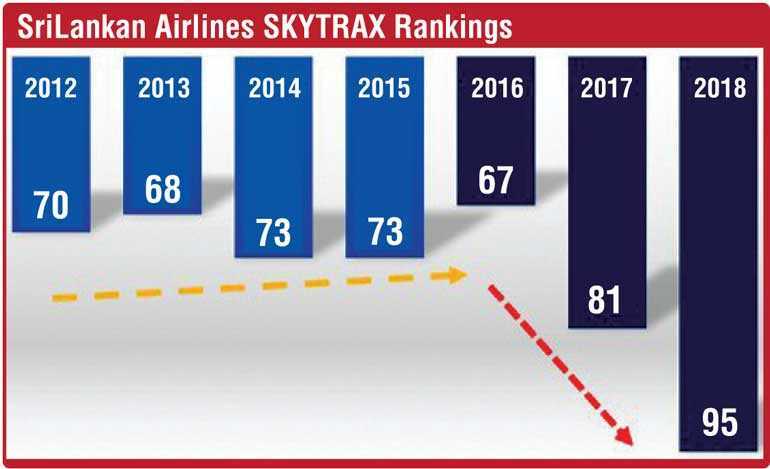 The poor performance under Suren Ratwatte was also correlated in the recent Skytrax Global Airline Rankings, where the rankings had dropped from a steady average position of around 70th position under Chandrasena, to the bottom of the league table to 95th position by June 2018 under Ratwatte. The destruction of high revenue generating European routes, fleet destruction (by extending leases of old planes), poor long-term fuel price risk management, Mihin Lanka closure, and self-inflicted massive losses due to cancellation of the A350 leases, may have caused permanent damage to any margin of opportunity for the recovery of the airline.